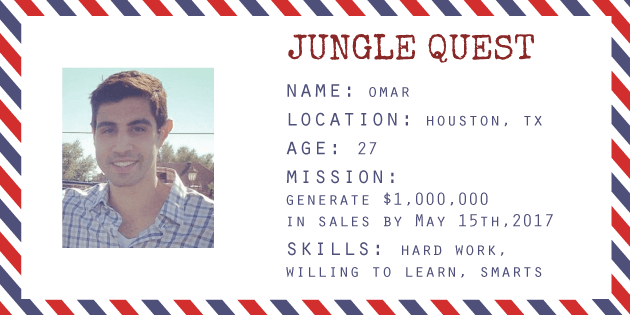 Jungle Quest is a challenge Greg and I laid out to make a Million Dollars in sales on Amazon within a year of the first product being delivered to Amazon’s Warehouse. After graduating in 2010 I quickly joined the Entrepreneurial journey both offline and online. My first online venture was in 2011 when I set up a plumbing supplies drop shipping business on Amazon.com. It was a great feeling making a few sales a day, but I knew it was a constant battle to compete with other sellers not only selling the same product, but listing it below the MAP (Minimum Advertised Price). I made my exit and started a successful Liquidation Export venture that was a little more hands on. It involved purchasing wholesale secondhand and customer return items from major retailers in the U.S. and exporting it to the Free Trade Port of Jebel Ali, located in Dubai. From there it was sold to traders in Central Africa and parts of the Middle East. While I absolutely loved the International Arbitrage side of the business, scaling the operation would have been directly dependent on the size of the warehouses, number of employees, and equipment such as heavy duty forklifts. So for the incredibly ambitious reader and myself, what really is holding us back? Yes, more private label sellers are coming on board, but so are product ideas and opportunities, so are millions of more Amazon prime customers. Amazon continues to grow. In fact Amazon added 10,000 new jobs in Europe in 2015, and the interesting thing is that the U.S. marketplace is still growing at a faster rate than the International Marketplaces. 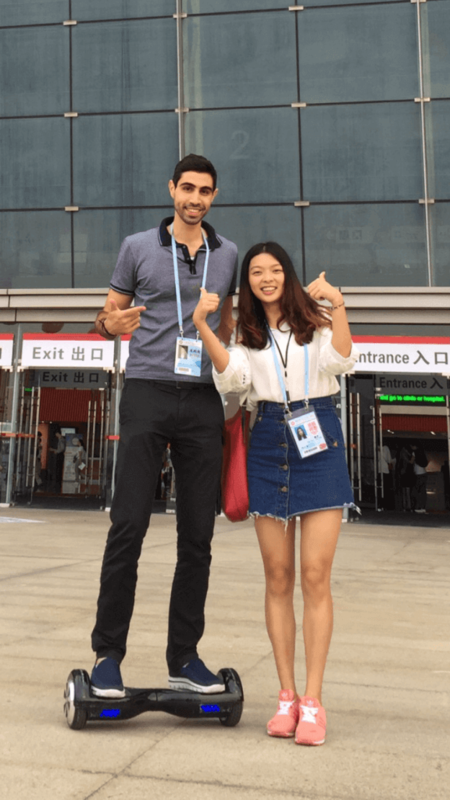 So when I met Greg in Hong Kong and Guangzhou during the Canton Fair exhibition this past October, our optimism and positive outlook with private labeling on Amazon led us to choose an ambitious but totally achievable number in $1,000,000. Me enjoying a segway before the Canton Fair. During the third week of December, Amazon added 3 million new Prime members and set a new record of 200 million products shipped as part of the Prime Shipping program. To improve shipping, Amazon experimented with a program named “Aerosmith” in which Amazon operated 4 cargo planes out of highly sophisticated facility in Wilmington, Ohio. The experiment has gone so well, Amazon is mulling the option to lease 20 Boeing 767 jets as reported by the Seattle Times. PrimeNOW, a service that offers thousands of Amazon products to customers in a one-hour to two-hour delivery period, has plans to expand past the current 20 cities, and the catalogue eligible for Prime now deliveries is ever growing. What these numbers mean to us is that our sales goal is not as daunting as it initially sounded. Although it will be challenging, we are confident in our business plan and the popularity of Amazon to help us succeed. Over the next year, we plan on documenting our Jungle Quest journey, and are asking you to come along for the ride. Our goal is to generate a million dollars in sales within 12 months of the first product arriving in Amazon’s Warehouse (May 15th 2016-May 15th 2017). We are expecting a huge boost in Period Two due to holiday sales. We are hopeful the age of the listing and the rank boost from the holiday sales will translate to a successful Period 3. Our initial five products will be manufactured in China and shipped to the FBA Warehouse designated by Amazon. In order to hit our target delivery date of May 15th, we will need to get the prospective factories lined up as soon as possible. Why? The Chinese New Year. Despite its name, the Chinese New Year is actually a holiday that is celebrated over the course of several weeks. It celebrates not only the turn of the lunisolar of the Chinese Calendar, but is also a spring festival. Chinese New Year is a very important holiday in China and if you are Importing and selling on Amazon I am sure you already see its impact! So how does this affect the Journey to a Million? In order to celebrate the New Year, most Chinese factories close for several weeks. This year, the Chinese New Year begins on February 8th, which means the first several weeks of our 2016 Quest will be quite hectic to say the least! Factories are already backlogged with orders, and many of the workers will not return till the first week of March. With a 30-45 day lead time and 30 day period to ship by sea, we have our work cut out for us 🙂 If we are to meet our May 15th delivery date, we need Chinese factories to begin production of our products immediately after they return from their holiday. This means that we will have to order and inspect sample products created by various factories in China as quickly as possible. We will be enlisting the help of some contacts in China with the goal of minimizing the impact CNY will have on our goals. These people are going to be responsible for receiving and inspecting each sample in China. This saves us around the average 5-7 business days it takes to import and inspect a sample. This tactic also lowers shipping costs by shipping domestically within China instead of to the U.S. The same people will also at times be used for payment. When a sample fee is paid in the USD, the receiver (supplier) is responsible for filing paperwork then waiting 3-5 days to receive payment in the local currency (RMB). By converting our currency to RMB before paying our supplier, we hope to eliminate this 3-5 day waiting period. Stay tuned for more information as we document updates, challenges and successes Jungle Quest has over the course of the next year. what are you projecting as your Upfront costs? But Cash Flow is the one of the biggest barriers in this industry..
2. Your cost per unit goes down because with larger orders you will ship by sea.. Instead of for ex. $3 by air per unit you might order enough inventory to where your average order per unit by sea is .40 cents! How do you handle getting the product from the port here in the US to the Amazon warehouse? Do you have your own warehouse here to accept the shipping container and unload / inspect everything..and then label and move it to an Amazon warehouse..or are you able to arrange direct delivery from a port to the Amazon warehouse? Or are you not purchasing entire shipping containers full of items? I have experience importing backyard chicken coops made in China about 5 years ago..I had to buy by the full container..and I off loaded directly into a small warehouse I had rented. I sold them locally and went through about 4 full containers worth before the local market became saturated and totally tanked. Looking forward to seeing how this plays out for you. Also curious how valuable you thought going to Canton Fair was? I almost did that 5 years ago before doing the chicken coop thing, but just couldn’t make the time with the other commitments I had at the time. All the best , keep us posted. I am planning to go Canton Fair either this oct or next march for sure.Will join your path soon. All the details are coming in. Awesome, I want to hear more about your journey, as I am starting mine in February as well!!! Wow!! this Jungle Quest is really exciting and to follow you both on this journey will be absolutely mind-blowing as we watch your business grow… the more I read here on JS the more I understand the process of selling private label on Amazon. I am totally new to all this, and thrilled that you are both on this fantastic journey and you will both exceed your target for sure… This just pumps me!! Awesome stuff Guys! Hi Omar, that’s quite an ambitious project you are about to start. It’s absolutely achievable, given the set plans indicated. It definitely will involve lots of hard work, but that’s what success is derived from. I’ll be following closely how you go about things, and will love to work alongside you. Wish you great success!